1 The luna moth looks very delicate. It has pale green wings. Each wing has a transparent eyespot. The hind wings of the luna moth have long curving tails. The luna moth has an average wingspan of three to four inches. It is usually between five and six inches long. The luna moth is a type of wild silk moth. The luna moth is also known as the moon moth. 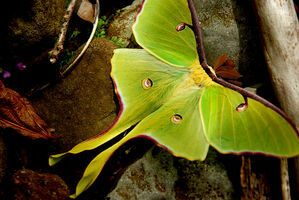 2 Luna moths live in North America in forests. Luna moths are nocturnal. This means they are active only at night. Luna moths don't have mouths. They don't eat. They live only one week. During that time they mate. 3 The female luna moth lays eggs on both sides of a leaf. She might lay an egg by itself, or she might lay a group of eggs. A week later the eggs hatch into caterpillars. The caterpillars are light green. They have yellow lines along each of their sides. They also have little reddish-orange bumps on each body segment. The caterpillars grow to about three inches long. They are plump and don't move very fast.